I’ve been trimming back perennials, raking gardens, clearing trails, pruning and transplanting. Happily, my spouse has been working along side of me, so it feels like we accomplish a lot in a short amount of time. We suffered a fair amount of vole damage this year, girdling the bark from many bushes and young trees (which frustrates me no end). With the bitter cold weather, there was dieback to trim from some of the more tender hollies and azaleas. I try to tackle a few things every day, but I am not as driven as I used to be. Lots of things won’t get done, so I have to make peace with that. I am happy that the daffodils are blooming and tulips are budding. The lawn is dotted in blue and white from naturalized puschkinia, chionodoxa and scilla. Soon it will be awash in a heavenly sea of white and purple violets, which hold a special place in my heart. I’ve had a hard time this year adjusting to the reality that ticks are now everywhere I go, be it yard, garden, woods or field, and every bite brings the threat of Lyme disease. I, and two members of my family, were diagnosed with it last summer and I know now what an awful thing it is. Trying to put a positive spin on it is particularly challenging given how much time I spend outside. I feel I’ve been robbed of the carefree joy and bliss of gardening – something I really love. Acceptance is slow in coming, but I won’t stay inside hiding. I take precautions and try to stay alert. I’m not going down without a fight! Perhaps I’ll get a flock of guinea hens, which apparently eat ticks. To me, they look silly, like comical cartoon characters. If I do, I’ll have to figure out how to keep them from being eaten by predators, like coyotes and foxes. Sometimes, life can be so complicated! 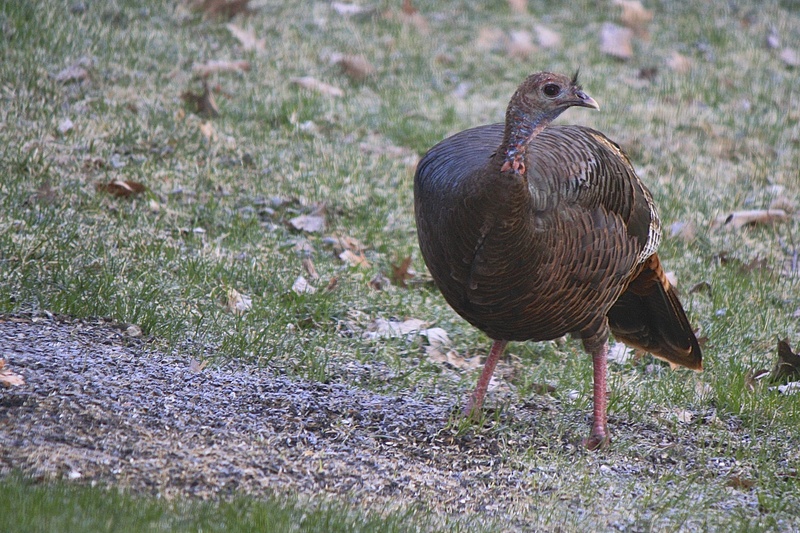 We have had a wild hen turkey visiting our feeders recently. I wonder if she eats ticks? She weighs at least twenty pounds, is quite healthy with beautiful plumage. Obviously, she found enough to eat all winter, but I wonder why she is alone? It is mating season and hopefully she will find a handsome tom and lay a nice clutch of eggs. In summer, I often see two or three hens foraging together with their broods in tow, like gangly teenagers, gleaning weed seeds and insects from the gardens and fields. They are entertaining to watch, very alert and good at escaping danger, dispersing at the first sign of threat in a burst of wings. 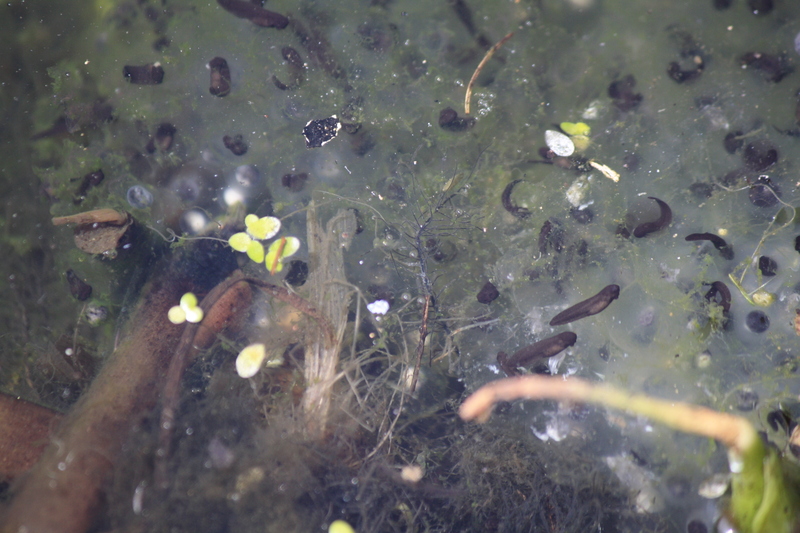 And for those who read my posts on Froggy Love, the results have hatched and now the pond has tiny tadpoles. 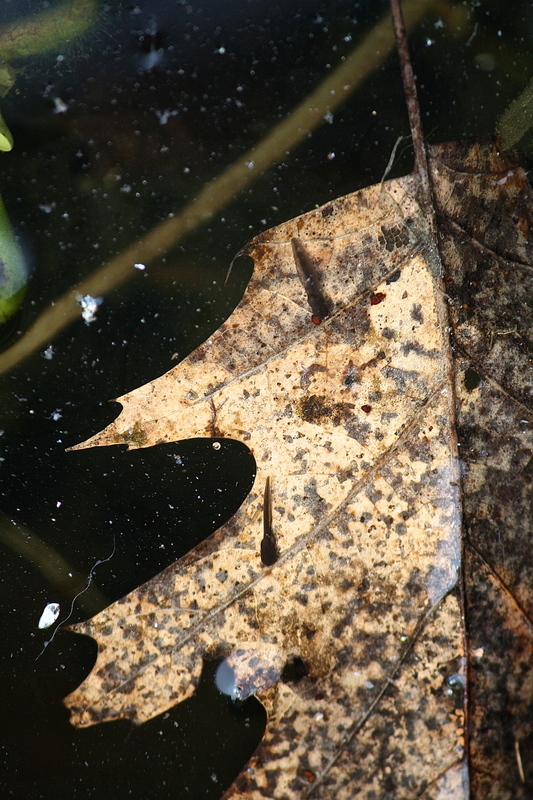 The amorous adult Wood Frogs have returned to forage in the leaf litter. They are very small and I am hoping the larger frogs won’t eat them before they get a chance to grow up. So far, we have had only a couple of male Spring Peepers calling each evening trying to attract females to this small pond, many fewer courtiers than we had last year. 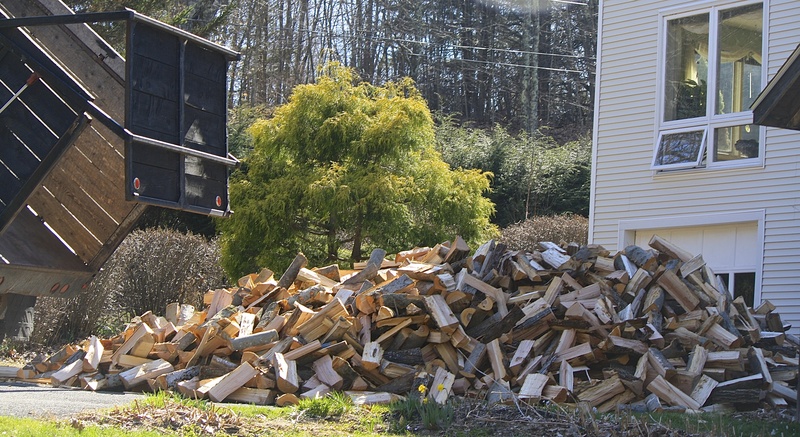 Another spring chore is getting our wood delivered, so it can be stacked in the woodshed to dry over the summer. We order it early before the black flies hatch out, which can drive us crazy, and while it is still comfortably cool doing all that strenuous work. At the rate of four to six pieces per armload, it takes quite a few trips to make this pile disappear! This year I was lucky enough not to stack one single piece of it; my husband and son (yay!) stacked all four cords in two days. That beats our previous record by two days! 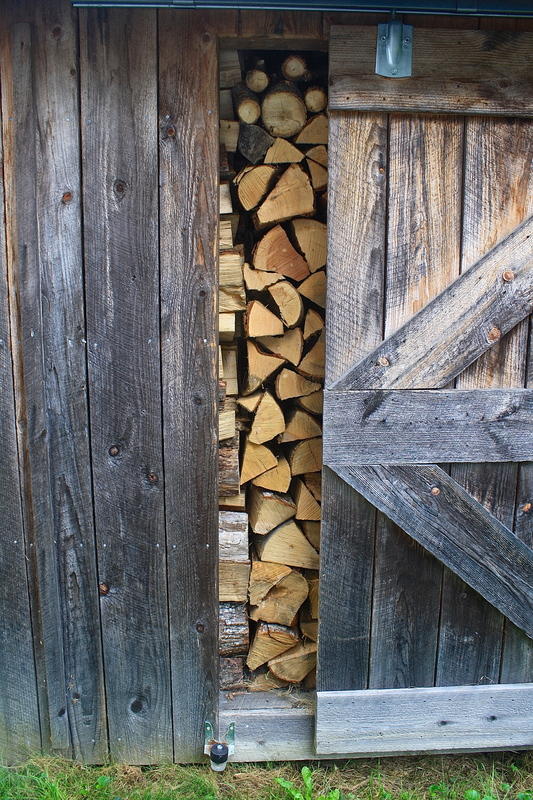 There is a lot of security in having a full woodshed – knowing we’ll be warm and cozy next winter. Even though autumn seems a long way off, and spring has barely begun, time has a way of passing much too quickly. We will be glad for the warmth this wood brings us when again the cold winds blow. Now that this chore is done, we are free to focus on all the joy that spring brings, like those red peony shoots I see rising through the mulch. 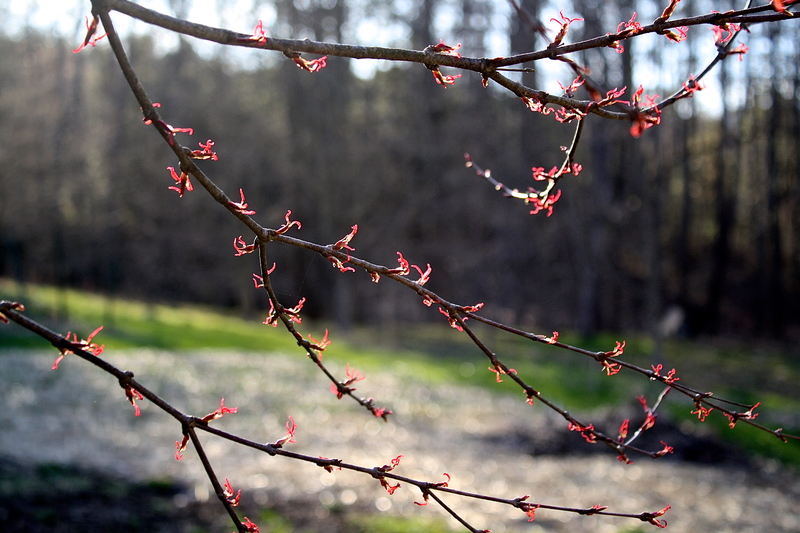 This entry was posted in Country Gardening, Country Living, My Photos and tagged daffodils, frogs, gardening, gardens, katsura tree, Lyme disease, photography, ponds, rural life, spring bulbs, tadpoles, ticks, wild American turkey, wood heat, wood shed. Bookmark the permalink. Eliza, this has to be one of my favorite posts of yours! The pictures were outstanding and I really got a feel for your life. I love how you admit that not everything will get done that you want to do, but that is o.k. And as a microbiology instructor, I can relate to your frustration about the ticks and Lyme disease. Sorry that you have already been exposed. My favorite bit, given my love of animal totems, was the part about the turkey hen. She is beautiful. From your perspective, do you think there is a chance that research will reveal an Achilles heel in tick-borne disease? I am envisioning that with all my might! Your comment about turkey totems sent me looking it up and how appropriate it is! “The symbolism of the Turkey focuses on the connection with the Earth and the abundance it provides.” Thanks Kim, as always, a pleasure! I too love this post Eliza because of the similar fears we have and the feeling of being robbed of joy in the garden. My niece contracted lyme about 4 years ago and is undergoing a brutal treatment program. I live in the country where deer are numerous and so are ticks. I feel paranoid wearing boots with pants tucked in and spraying with “Off” and resisting going out to dig even though I want to get out there in the worst way. 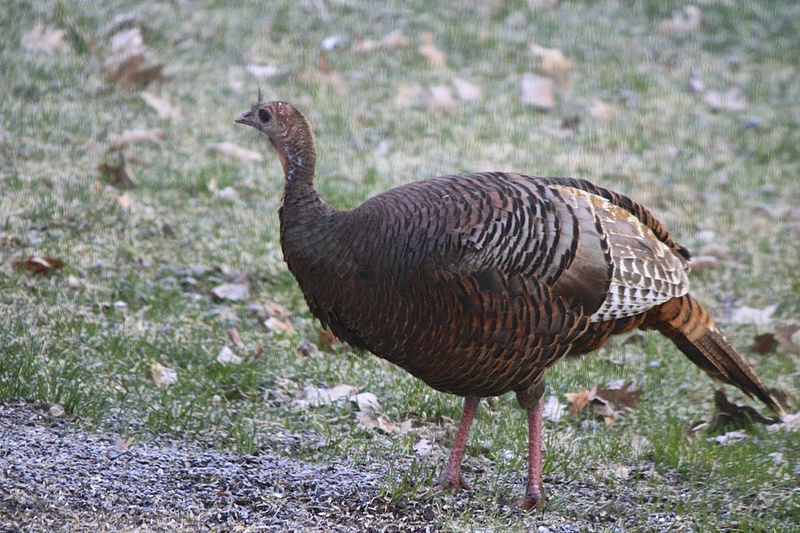 We too have grand big turkeys in what I call “herds” of 20 or more. Similar lives – similar fears. I love your photos here too. BTW – our crepe myrtle has a full dress of brown leaves. I don’t think she’s dying but have you ever heard of such a thing in spring? Did you have record cold this winter? Your crepe myrtle may have got nipped by frost. Or perhaps something has girdled its roots. Undiagnosed Lyme is brutal indeed. It is very destructive. I went on the CDC website for stats by state on Lyme and the Northeast from VA north is the hardest hit, followed by the upper Midwest. In some states 3/4 the population has had it. Epidemic. Hello NIH, are you doing anything about this? Lyme’s disease is so brutal. Best wishes in managing it. We have so many ticks here, too. I put the tick meds on my dogs but they still seem to hitch rides in on their fur. I’d go for the guinea hens. Sounds like a fun adventure! Thanks so much for stopping by. I’ll keep you posted on the guinea hens! Eliza, you’ve painted such detailed picture with your words and photos. Although I admit, much of what you describe is like another planet. I can only imagine, with your help. I like the thought of a full woodshed, and turkeys, and trails. But the ticks I find frightening. I could let my imagination get the best of me. How gorgeous – especially that first shot! This is a beautiful post, Eliza! All that wood reminds me of when we used to bring in cords of wood–stacking it was something I loved, it was so beautiful afterward. We made the mistake one year of stacking it inside our attached garage not knowing it was full of hibernating bees! I have one crazy question since I’m just starting to take pictures of my plants: The daffodil photo has blurred flowers/foliage in the background. Was that intentional or did it “just happen?” I love it! Thanks, Mandy, for your kind words and wood story. How did you deal with the bees or were they wasps? 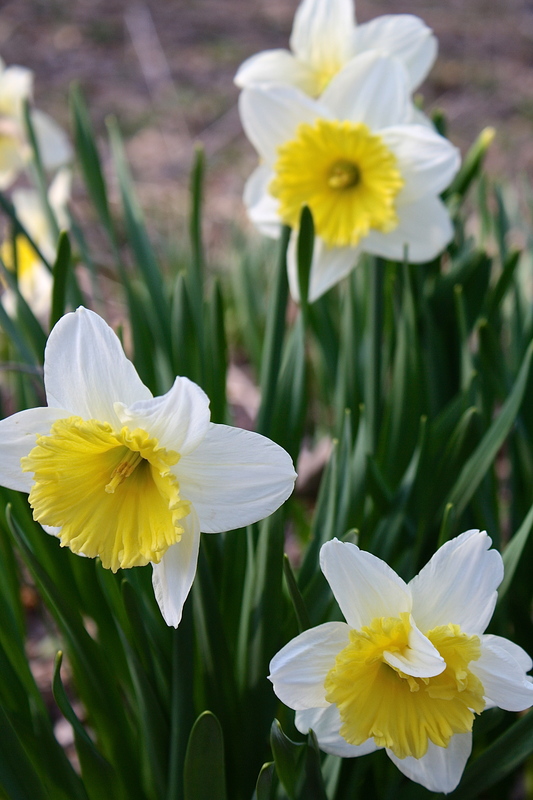 Re: the daff photo: I was too close to get all of the flowers in focus as a group, so just the front two were focused. Does that make sense? Sending good wishes your way…. I hate ticks! Be well. Thanks so much; yes, ticks can be such a problem. I appreciate your visit! Thanks for thinking of me, Maria. I am honored! I will check it out. Have a wonderful day! Your pictures are beautiful! I can’t wait to get into the garden. It’s taking to long to warm up this year! Thank you! I agree that it is slow to warm up this year – today was downright chilly! Like these photographs very much; the first and last offer a wonderful contrast between fragility and solidity. So sad to hear about your frog pond. Can’t you return the newts, or is that impossible? 🙂 Amphibians the world over are suffering, I’m afraid. They are our canaries in the coal mine, but few are paying attention. Thanks for stopping by and commenting. I appreciate it! Darn ticks! I’m sorry they’re such a problem on your property. This post gives a great feel for your life and land. It sounds like paradise! Thanks, Sharon, it does feel like paradise. We’re learning to adapt to the ticks – being more diligent checking ourselves, bug spray, “sweeping” with a sheet the areas we frequent. We’ve been spoiled all these years, so now it is time to pay the piper, I guess!